Saving Energy One Step At A Time With saveONenergy! Saving is important in our family, especially when we are saving on energy in our home. During the winter months we consume more energy than the entire year because of gas heating and shorter days mean longer times the lights and other things tend to be on. 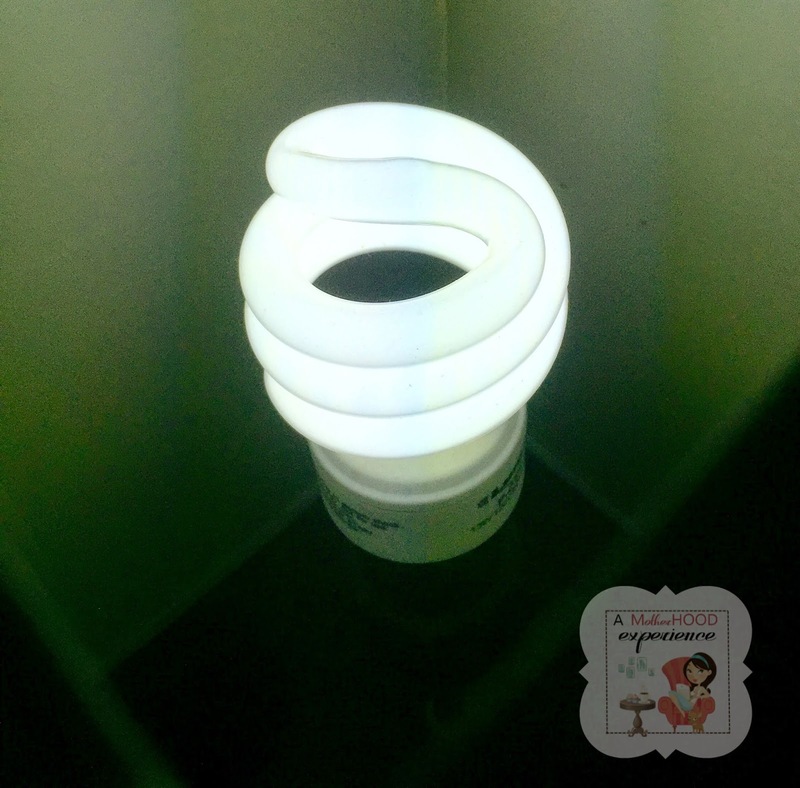 - Switching from normal light bulbs to LED bulbs. Not only do they produce less heat and energy than regular bulbs, they also last longer and brighten rooms just as well if not better. We have been using energy efficient bulbs for years now. - Hanging laundry to dry. Once the snow is gone, the temperature rises and the sun is out more, we can begin hanging our clothes outside on the line to dry. Don't have a back yard or area to put an outdoor clothesline, no problem. You can get drying racks which can easily fit indoors in your laundry area or on a balcony or small outdoor patio space. - Installing light timers, motion sensors and dimmers. These are especially useful for outdoor lights or lights you don't need to constantly use. We have a back door light which comes on with motion. It isn't constantly going but lights up when needed. Saving your energy and also the bulb as it's used less than a typical light. - Get rid of ghost energy. Did you know that even when an electronic like a TV, cellphone charger or computer is powered off it can still consume what they call "phantom power"? Using electricity unless they are completely unplugged. What a waste! By plugging electronics into an energy efficient power bar you can reduce the use by turning off the power bar itself, thus cutting off any unwanted, unused and wasted electricity. We live on power bars with all the electronics we have. - Installing a ceiling fan can help circulate air in your home with air conditioning. With a ceiling fan running you can turn down cold and still be comfortable. We rent our home so we cannot install a ceiling fan, we use standing fans or square fans in the summer and keep the windows open but my parents always had one running in the house, even lightly in winter to help circulate the air. Great idea that has been used for years! - Save some hot water by changing the shower heads and kitchen faucets to energy efficient ones. You can find these at your local hardware store. Also, it's a good idea to reduce the temperature of your hot water tank when you leave on a vacation or in the hotter summer months. I find we tend to not need the water as hot during the blistering month of July into August most of the time. Investing in small changes around your home will help you save in many ways in the long run. 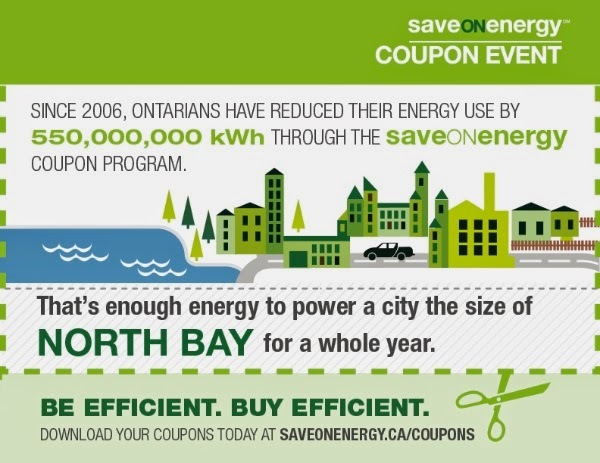 Did you know that since 2006, through the saveONenergy coupon program, Ontarians have reduced enough energy to power a city the size of North Bay for a year! That's a lot of power my friends! You can get in on the savings too! From March 27 to April 26, saveONenergy spring coupons offer discounts on LEDs and a wide variety of energy efficient products at participating retailers across Ontario! The Spring Coupon Event is one of many offered by the Independent Electricity System Operator (IESO) and local distribution companies to help Ontarians better manage their electricity consumption and reduce electricity costs! Download your FREE coupons today by visiting saveONenergy.ca/coupons! Follow @saveONenergyONT on twitter for more tips and tricks to help you become more energy efficient! Posted on behalf of saveONenergy. Complimentary coupons and gift card received as a thank you. 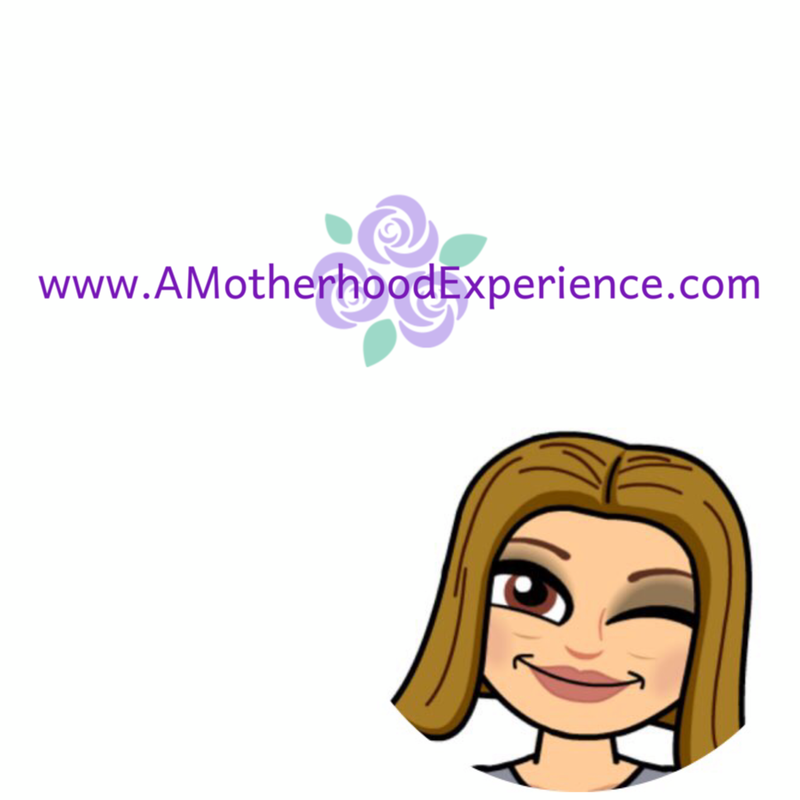 Opinions and comments on this blog are honest and my own.